don't you wanna get married? It’s been a little more than three years since AT&T dumped T-Mobile at the altar when it became clear that the FCC and Justice Dept. wouldn’t sign off on the marriage. And while the little magenta wireless company has done okay for itself since — building out a decent LTE network, shaking up the subsidized device/contract model, and helping to preserve what little competition remains in the market — its parent company still wants to see T-Mobile USA married off to a wealthy American suitor. Tim Hoettges, CEO of T-Mobile owner Deutsche Telekom, tells Re/code that he believes the only way the “un-carrier” can survive is if it partners up with someone else. Under the leadership of brash CEO John Legere, T-Mobile USA has tried to chisel away at the larger competitors with price cuts and offers of paying to get users out of their contracts early. But at some point, those promotions have to pay off. He says he was “intrigued” at the notion of creating a “super-maverick” wireless competitor with fellow second-tier carrier Sprint, though previous discussions of a merger stalled because of the message sent by the regulatory response to the AT&T/T-Mobile mash-up. “I hope that the political environment will change at one point in time,” admits Hoettges. Even a combined Sprint and T-Mobile would still likely be in third place behind Verizon Wireless and AT&T. Because of this overwhelming market control by those two companies, Hoettges contends that AT&T and Verizon have a huge advantage when it comes to buying other resources, like the current spectrum auction. He tells Re/code he’s “worried” that T-Mobile and Sprint are being outbid and will fall farther behind the two market leaders. While Hoettges might dream of seeing his little T-Mobile starting a family with a Sprint or an AT&T, the most likely way to get a mega-merger through the regulatory gauntlet is to combine two companies that complement each other but don’t compete head-to-head in the same industry. This is why AT&T’s pending merger with DirecTV is getting significantly less heat than the failed AT&T/T-Mobile deal or the year’s other big wedding between Comcast and Time Warner Cable. is romance in the air? 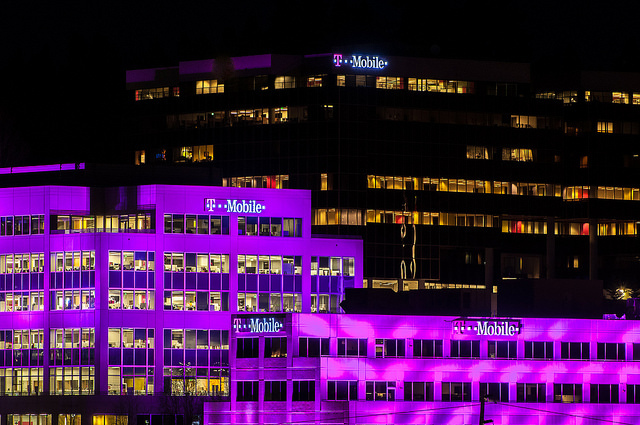 Are T-Mobile Tuesdays T-Mobile Terrific, Or T-Mobile Trash?